The past four years have been very special for Susie and me. We have had the rare privilege of editing this newsletter and reporting about many of the Q fly-ins held around the country. Sitting in the "Editor's" seat has given us the opportunity to observe and learn from some of the best builders anywhere. I, personally, have also gained a great deal of knowledge from researching and writing articles for this publication. The mere act of analyzing data and condensing thoughts has helped me better understand the issues at hand, as well as the impact of possible solutions. I directly attribute my successful test flights to what I have learned through the QBA. I will forever be indebted to Q builder/friends who have shared their experiences, insights and wisdom to keep me on the right track. After much deliberation, Susie and I have decided it is now time to step down as editors of Q-Talk. Not only have we have been producing this newsletter for four years but other types of publications for three years prior. "Richardson Publications" is ready for a much needed rest. We are happy to announce that your new Q-Talk editor will be Doug Humble of Omaha, Nebraska. 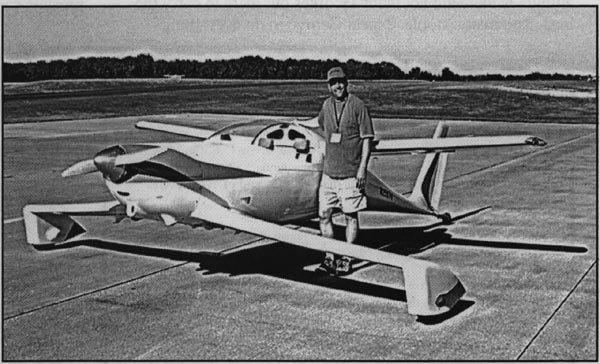 You can read about him and see photos of his plane as part of the Sullivan '04 fly-in coverage in Q-Talk, issue 107. Doug has been very active in the Quickie Builders Association and brings a graphic arts background to the table. He has some exciting plans to update both the newsletter and the QBA website. I have previewed some of his ideas and have been very impressed with his suggestions. In fact, Doug is working on an incentive for those who submit their 2005 subscriptions prior to March 1, 2005. He has developed a decal that you will be proud to display, depicting the three major Q plane types. He is only printing a limited number and they will be sent out on a first-come-first-served basis. If there are any decals left after March 1st, they can be purchased for $1.25 each, plus shipping, from Doug, until they are gone. We welcome Doug to the post and thank him for agreeing to take on a leadership role. Please remember, there are at least two ways all members can support the Quickie Builders Association newsletter. The first way is through your dues. Your $20.00 makes it possible to physically create and distribute the publication. The second and most important way is through your article and photo submissions. This is the backbone of the publication and an essential part of its existence. Q-Talk is your voice in the Q community. It is your opportunity to help others with similar goals achieve them quicker and more efficiently. 20% of all QBA members have given of their time through writing for Q-Talk. They have supported the group in the best way possible and deserve gratitude. When I was growing up there was a phrase, "Let George do it." That meant, though I should act, I will let another guy, George, shoulder my responsibility. The problem with this attitude is there are not many Georges out there to carry the load. Too many people expect George to do everything. The surest way to burn out your new editor would be to live by the phrase, "Let George do it." You can support the QBA in the future by taking responsibility, by being a "George" and submitting relevant articles and photos. This would ensure the continuation of this worthwhile venture. Again, thank you for the opportunity to serve as your editor and to get to know many of you as friends. Susie and I will continue to attend fly-ins and do our part to strengthen this wonderful organization See you in the skies. This is Dave Richardson's Tri-Q2 N825DR taxing to its first flight. Like Dave and Susie ending their time as editors of Q-Talk, the plane seemed to say "Bye-Bye" to its time in the hangar and "Hello" to a new adventure! You can order a printed copy of Q-talk #108 by using the Q-talk Back Issue Order Page.